"no, honey, we can't keep him--he already has a home!" These stray dogs have been found, but are not with their current owners. Help them find their way home to their families. Please contact the person directly if you can help guide these strays to their homes. You can click on any of the photo's below to view a larger image. If you have found a dog, you are welcome to list the dog here. Please email us with a picture and description of where the dog was found. Also please view this helpful tip sheet to help the dog you found find their way home. These two dogs were found running loose in Pottsville PA. They were both wearing collar and tag but the tags are not readable. 1 white male and 1 black and white female, blue eyes, intact, crate trained, very friendly. They know sit, lay etc. They are not microchipped. Finder has tried local vet, shelter, and flyers. If you know who these two dogs belong to, please contact Barb at 570-622-1834 or indypenn@verizon.net. Attached are several pictures of the young female Siberian Husky that was found by a worker at the Hillsborough Senior Center. I took her to our local vet. They scanned her and found that she is indeed micro-chipped. When they called Home Again, however, they were told that the dog apparently came from a kennel in Hunterdon County, but the chip is not registered to a name, address or phone number. If anyone is missing this dog please contact Bob at rpeabaker@comcast.net. Found mid August 2007 in Jamaica Estates, Queens, NY. 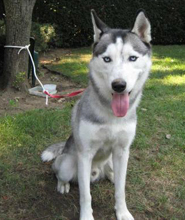 The dog is a male siberian, grey and white, with blue eyes, not neutered, no microchip, estimated to be 1.5 years old. A good samaritan is currently taking care of the dog until the owner can be found. This dog is very clean. Couldn't have been on the street that long. He must live in Queens, somewhere. He is well trained. He goes outside, sits and stays, gives paws and kisses. Someone must be missing him. Please call 917-626-8752 or email Cathy. Found in Elkton, MD, black and white with blue eyes, neutered male, found with no collar, quite an escape artist, took to the vet and has no microchip, vet estimates about 2 years old, has a broken left upper canine tooth, very nice dog and knows basic commands. Is being held by lady who found him, she has put up flyers, listed him on Craigslist as found dog, contacted the SPCA's in her area as well as the surrounding vets. If anyone is missing this dog please contact Jodi at 609-760-7856. 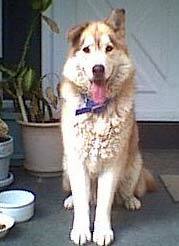 Last Friday, July 20 my parents found what they think is a husky or malamute, male, blue eyed, dog and people friendly. They live in Tunnelton, WV (zip code 26444). They can be reached at 304-568-2500 if anyone recognizes his picture. There was some kind of week long camping festival in a nearby town the previous week and some people reported lost dogs; she talked to two people already from that event but both of them had lost female huskies. The local papers and radio stations have been notified. He's clearly an inside dog and somebody's baby. 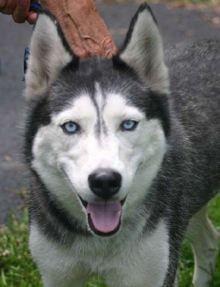 A white and cream neutered male with blue eyes was found on March 30 in South New Berlin, NY. He is thought to be young. He was not wearing a collar. He has lots of energy. If you think this might be your dog, or know who he belongs to, please contact Carol. 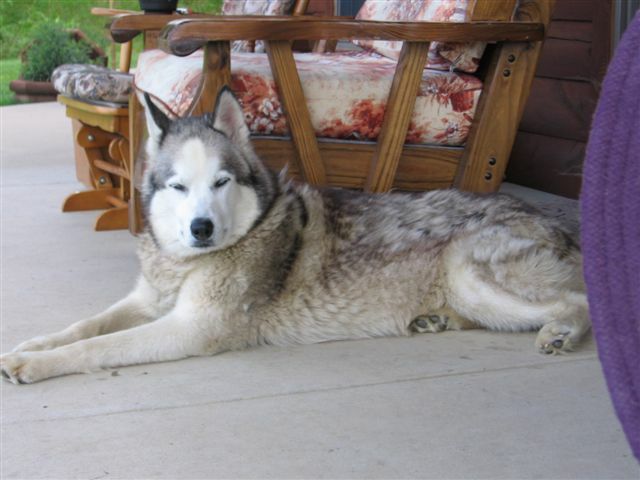 My neighbor's parents found a Siberian Husky on their 5-acre homestead one day. She was just laying on the porch like she belonged there but she did not. They could not keep her there due to their dogs so their daughter [my neighbor] brought her to me because she didn't want to take her to a shelter. 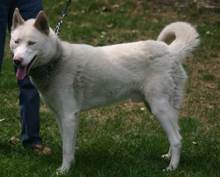 She has very distinct markings - a mask of gray/black [like a raccoon] around her eyes with some tan areas above and her tail is tipped in white. At first we were calling her "Frankie" due to her blue eyes [like Frank Sinatra]. If you think this might be your dog, please contact Connie at CCthomas@comcast.net. 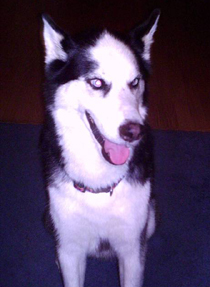 Female siberian husky puppy, approximately 6 months old, found wandering in Ardsley Park area of Savannah, GA with no tags or microchip, about a week before Thanksgiving '04. If you think this might be your dog, please contact me at (912) 443-9263 or paulinepauline@msn.com and be prepared to describe her or send a photo so we can be sure. He's about 6 years old and very well behaved. He comes when called, sits, lays down, and gives paw. He is very clean, a little overweight, and just all around well cared for. I feel like someone must really be missing him. I've had him for two weeks now and nobody is looking for him in this area, so I really don't believe he is from around here. He left the yard for about 10 minutes the other night and came back. I think if he was from around here he would have headed home. On Sunday night during the snowstorm we came upon two dogs outside my apartment. We have yet to locate their owners. Within a week, we will be giving the dogs to a shelter as I live in an apartment with a "no pet" policy. Unless the owners contact me in the meantime, we are looking for good homes for these two dogs. They are both male and look like Husky/German Shepherd mixes, though I'm no expert. They are pretty large, say 50 to 70 lbs. They are great dogs with a very sweet disposition. Both are house trained, though neither is very good on a leash (walking two through ice was like Iditarod). They are very happy together, though if need be we'll separate them. I would guess they're between two and four years old. CONTACT: Pam at Phab2@aol.com or 1-717-776-5382 and refer to case number #0107250777FD. 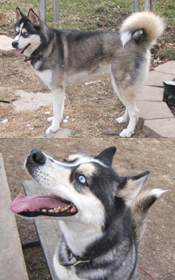 He is a neutered male Husky Mix. He was found wearing a royal blue nylon collar. He is housebroken and is very friendly.